When Microsoft announced it was rebranding its phone hardware as “Microsoft Lumia”, it hinted that there might be a new phone on the way, with the Nokia Conversations blog post quoting Senior VP Tuula Rytilä as saying “we are looking forward to unveiling a Microsoft Lumia device soon”. 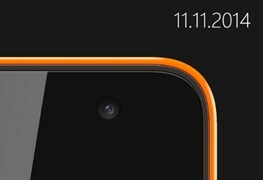 Then tonight, a new post on the blog hinted even more strongly that a new Lumia is coming, this time giving us a date – November 11th. Microsoft is delivering the power of everyday mobile technology to everyone. Come back on November 11, to find out more! While there’s not much to go on from the few words of text and the teaser image, a number of sites noted similarities in the image to a recent post by Chinese site Tenaa, showing images and specs for a low end phone they call the RM-1090. Those specs describe a phone with a 5″ screen, a 1.2GHz Snapdragon 200 chip, dual sim, 1GB RAM/8GBROM, a 5MP camera and a 1900mAh battery. Not exactly flagship specs, to be sure, but probably better than nothing as many of us have given up the thought of Microsoft releasing anything in time for this holiday season. VentureBeat among others also notes that this new phone may well be christened the Microsoft Lumia 525, although that seems to be pure speculation at this point. We also don’t know what markets the new device will debut in, or even if it will make it to market in time for the holidays. Next year seems to be gearing up to be much more of a make or break year for Windows Phone, with a new OS in the pipeline, the convergence of app models between Windows 10 and the phone, a bit of a down cycle for new Apple phones, and what will have to be a major marketing push for Windows 10 and Windows Phones. Still, Microsoft needs to be in the market in at least some capacity, and a new phone, any new phone, is welcome news. We’ll find out more next week!